Are you Looking for WBCS 2019, UPSC Civil Service Exam's Indian Modern History Questions Questions Quizzes? If your answer is yes, then here is the right place for you. 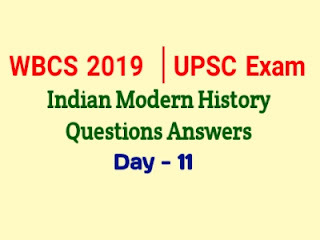 Indian Modern History Questions Quizzes help you to take better Preparation for UPSC Exam, and Other Civil Service Exam like WBCS 2019. UPSC Indian Modern History Questions Answers Quizzes Below here. When was the First Round Table Conference held? Who founded the 'All India Harijan Samaj' in 1932? Which of the following leaders died as a result of Injuries sustained during a protest demonstration against Simon Commission? Who gave the slogan 'Inquilab Zindabad'? Who said that the exploitative nature of British rule was'Bleeding India White'?